Few cancer treatments are generating more excitement these days than immunotherapy—drugs based on the principle that the immune system can be harnessed to detect and kill cancer cells, much in the same way that it goes after infectious microorganisms. Yet these treatments only benefit some patients, and remain ineffective in the vast majority of cases. 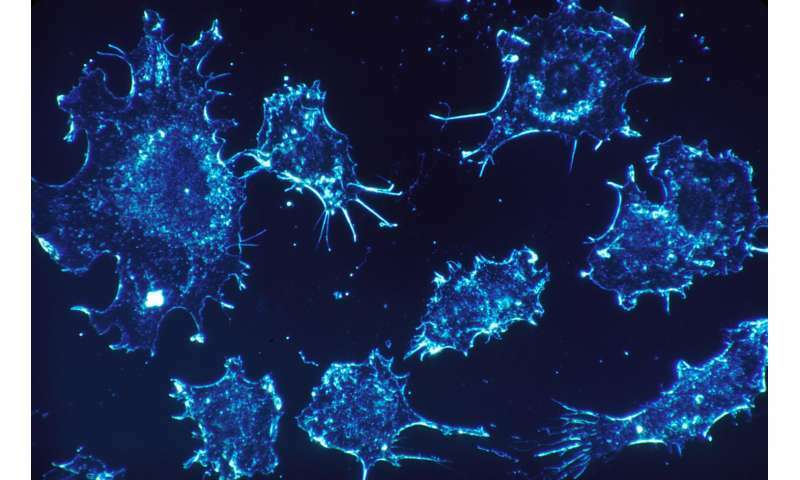 Cancer cells are crafty, and they have many ways to protect themselves from immune onslaught. A Rockefeller team is now reporting on a strategy to get around cancer's protective barriers, making it easier for immune cells to do their jobs. This approach focuses on immune cells called myeloid-derived suppressor cells, or MDSCs, and appears capable of destroying a number of different cancer types in mice. Moreover, findings from the first-ever clinical trial of this treatment reveal that it is effective in activating immune cells that kill cancer cells. The results are published this week in Cell. "MDSCs are known to prevent other types of immune cells, such as T cells and Natural Killer cells, from being able to target cancer," says Sohail Tavazoie, Leon Hess Associate Professor and a senior attending physician at Rockefeller and the study's senior author. "We predicted that if we could find a way to kill MDSCs, it would lead to the activation of beneficial immune responses." In earlier work, Tavazoie's lab had studied a gene called ApoE and its role in suppressing the spread of melanoma tumors from their site of origin to other organs. They found that increasing ApoE led to reduced metastasis, by impairing cancer cells' ability to invade healthy tissue and to grow blood vessels. In their most recent experiments, the researchers subjected mice with different types of cancer to a compound called RGX-104, which is known to induce the body's production of ApoE. The compound turned out to be effective against a number of tumors types, notably lung, kidney, ovarian, and breast cancers, as well as melanoma and glioblastoma brain cancer. It killed off the mice's MDSCs, and the scientists confirmed that killing these cells allowed other immune cells to come in and destroy the cancer. RGX-104 also is being tested in a multicenter, Phase I clinical trial in people with a number of different types of cancer. The compound is being evaluated on its own and also in combination with another type of immunotherapy drug called a PD-1 inhibitor. The Cell paper reports early findings from that trial for the first six patients, which showed that people who received the compound had a reduction in the number of MDSCs in their bodies and an increased immune response. "This is the first time we have advanced our lab work to clinical testing," Sohail Tavazoie says. "We were thrilled to see that in all the patients tested so far, the drug effected the immune system in a similar manner as what we had observed in mice." The researchers plan to eventually include 120 people in the trial, which is currently enrolling patients, and they expect to report more results later next year. "Sohail's research into the deep biological mechanisms underlying the regulation of cancer and metastasis has allowed him to take his projects in unexpected directions," says Daniel Mucida, an associate professor at Rockefeller who was a co-senior author on this research. "We look forward to continuing this collaboration and extending it into additional cancers."